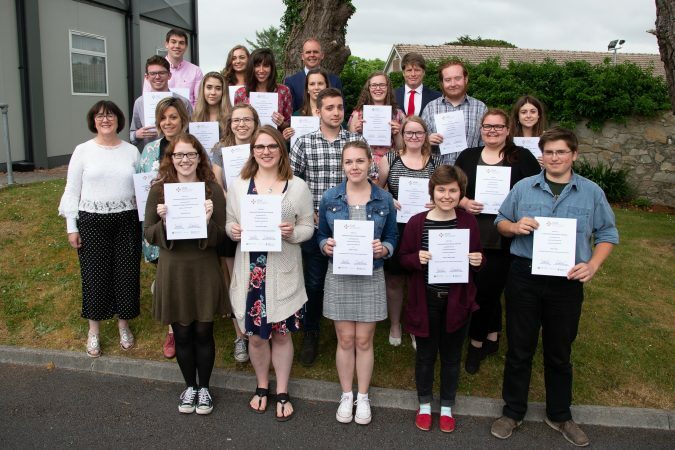 Minister of State at the Department of Culture with responsibility for Gaeilge, Gaeltacht and the Islands, Joe McHugh, presented awards to 15 Canadian Scholars and a number of ICUF’s 2018-19 Teagascóirí Gaeilge in the Acadamh na Gaeilge, An Cheathrú Rua in June 2018. Included in the picture with Minister McHugh and awardees, are James Kelly, ICUF, and Treasa Uí Lorcáin, Acadamh na Gaeilge. Gaeilge, the Irish language, is the first official language of Ireland. Once widely spoken throughout the island of Ireland, now championed by a minority, it is an ancient language with both a rich cultural history, and a key part to play in a vibrant 21st century Ireland. An official language of the European Union, recent years have seen a growth in its usage, in Ireland as well as overseas. In recognition of its unique cultural significance, the Irish Government initiated a programme to support the growth and development of the language in a number of countries throughout the world. A remarkable 4.5 million Canadians trace their ancestry back to Irish settlers. In supporting the development of the Irish language in Canada, this programme opens the door to the exploration of a shared culture and heritage, contributing to a deeper understanding of the rich and multiple links between two countries with a rich shared history, and a friendship spanning centuries. Since 2009, with funding from the National Lottery and the Department of Arts, Heritage and the Gaeltacht, ICUF has annually administered a number of awards to support the development of the Irish language in Canada. Teagascóirí Gaeilge are appointed each year to teach Irish in our partner universities, and surrounding communities. To find out more about these awards, click here. In conjunction with our partner universities and Oireachtas Gaeilge Cheanada, a number of scholarships are provided to Canadian scholars of the Irish language to attend attend an intensive residential Irish Language course in the National University of Ireland, Galway campus in An Ceathru Rua. To find out more about these scholarships, please click here.